To be considered All-State, a runner must place in the top 25 in the IHSA State Meet. This page honors those individuals. They are listed in alphabetical order. Ben was our first All-State runner, placing 24th his senior year. He improved a lot over his four-year career. He came out for cross-country to get in shape for baseball and never looked back. Ben ran just under 17:00 his freshman year and improved to run in the mid 16’s his sophomore year. His junior year, he was hampered by a sinus infection and did not race for almost three weeks before the Sectional meet. He managed to run 15:48 at the State meet to help us finish tenth that year. During the summer before his senior year, Ben made up his mind to work really hard. 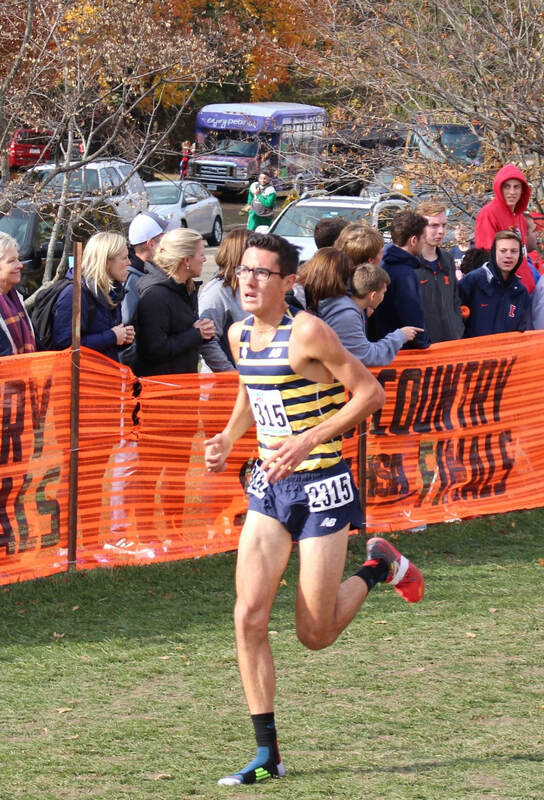 He turned in an outstanding early-season time of 15:17 at the Peoria Notre Dame Invitational and won the Upstate Eight Conference championship. He then earned his All-State recognition by almost breaking 15:00 at the State meet. Aaron Beattie: 13th as soph in 2007 (14:44.2); 4th as a senior in 2009 (14:31). Aaron came in as a talented freshman, having run in the low 5’s for the mile as an 8th grader. He got off to a slow start his freshman year, not joining us for summer running until early July. As Aaron rounded into shape, he showed his competitive fire in the conference meet, finishing as the top freshman in 5th place. After putting in a great base during the winter, Aaron continued to improve and broke 10:00 for the 3200m that spring. However, it was the summer of 2007 that propelled him into becoming the fastest sophomore in our history. Aaron trained consistently and put in the miles without overdoing it. For the first two meets, he ran at the f/s level until Jimmy Riddle got hurt. His first varsity race was at the Culver Invitational where he started to show everyone he belonged at the varsity level. His true breakout race came at the conference meet where he ran 14:37 to finish 3rd behind teammates Chris Derrick and Danny Pawola. Aaron went on to finish as the top sophomore in the State, helping his team win its first State title. His junior year was a disappointing one due to an IT injury that put him on the sidelines for more than 4 weeks. He ran in the State meet but was not in top form and ran 15:03. Aaron’s senior year was one to write home about. He was conference champion, regional champion, and finished fourth at State. He ran a great race at the State meet by being patient in the warm weather to help his team win a state championship. Aaron is one of four runners in our history to finish all-state two times. Nick had a great career with us, running varsity for 3 years. Even though he did not look fast, his strength and determination enabled him to go down in history as one of our all-time greats. He broke out in the fall of 2011 as a sophomore. His consistent performances provided us with a solid 4th man on a team that finished 3rd in State. If it were not for some illness at NXN that year, I think we would have qualified for the 4th time to the NXN National Meet in Portland. Nick’s junior year showed he belonged with the State’s elite. Nick ran 14:52, but only managed to finish 41st in a very fast year. Our team finished 6th. Nick’s senior year was made of some ups and downs, but we knew he would be ready when it counted most, and he was. He ran a solid 14:51 at State to finish 15th on a much slower course than the year before. Nick was a two-time conference champion, a feat only equaled by Chris Derrick. Nick also achieved something very special. He was only one of 13 young men in the entire State named to the IHSA All-State Academic Team. He will continue his running career at Illinois, running for the club team to hopefully earn himself a roster spot in the years to come. 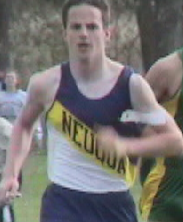 Chris Derrick: 3rd as a junior in 2006 (14:21.6); 1st as a senior in 2007 (13:51.8). Chris is a true inspiration to all who want to become a great runner. Chris was introduced to our program via a recommendation from another parent and reluctantly joined our summer program. As a freshman, he ran 18:12 for three miles and was our 7th man on the f/s squad at the conference meet. As he continued to mature, it was obvious he had a real passion for running. He joined forces with upperclassmen the following summer and trained smart. It was my intention to run him in f/s races that fall, but he never gave me a chance. He was our #1 man on the varsity from the first meet and placed 43rd at the IHSA State meet while running 15:06. Young for his grade (Chris turned 16 in mid-October his junior year), he kept growing and trained consistently (his secret J). Beginning with his victory at the first invitational of the year, it was obvious he would be tough to beat. He won the Upstate Eight conference title with ease and finished 3rd at the IHSA State meet running a school and then District 204 record of 14:21.6.Chris’ senior year will go down in history as possibly the best season by an Illinois distance runner. He broke 8 course records, while going unbeaten. He ran one of the fastest times ever run at Detweiller in winning the individual State title and led his team to the first ever AAA State Championship. He then led our team to a national title in Portland, Oregon at the Nike Team National Championships by winning individually. A week later, he finished second at Footlocker Nationals in San Diego, CA. During that spring, he ran a 13:55.98 5k at the Arcadia Invitational to run the fastest 5k ever run in a high school only race. Mark never ran in middle school and it took a little convincing to get him to run in high school. He did not grasp onto the work it took to be successful until midway through his sophomore year. That year he ran 16:51 at Conference to place 4th overall and finished 42 seconds behind teammate Taylor Soltys. The summer before his junior year he was hampered by a couple injuries (he was kicked in the ankle by a mad girl) but he finally rounded into shape and was looking like he would challenge for an all-state spot. 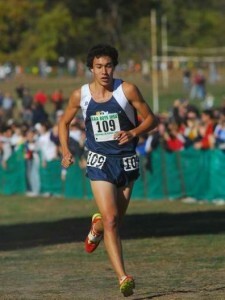 However, during the 2010 State meet, he lost his shoe about 800m into the race (a Mark Derrick trademark). He still managed to run negative splits and dip just under 15:00. After a great track season and a 9:14 3200m, Mark looked primed to challenge for a top 10 spot that next fall. He did just that, running 14:37 his senior year to finish 9th at the State meet. His first invitational win came at the Northside/Southside Challenge in early October. He then went on to become the Upstate 8, Regional, and Sectional champion. After the IHSA season, he finished 21st at the Midwest Region Footlocker meet, a great performance to cap his xc career. Nick was a varsity contributor all four years. During his freshman year, he was our 4th/5th man and helped us win our first conference title. He ran 16:13 at Detweiller that year. He had a mediocre sophomore year relative to his freshman year, but helped us qualify for State for the first time in our history. He was our 4th man, running 15:55. It was the summer before his junior year, that Nick decided he was going to be more consistent and really work hard. His hard work paid high dividends. He ran 15:13 at the IHSA State meet and narrowly missed being All-State (29th). As a senior, Nick became a vocal and very effective leader. His work ethic continued to improve and he was the Upstate Eight Conference champion. He capped off his senior year by running 14:46 at the State meet to lead us to a 4th place finish as a team. 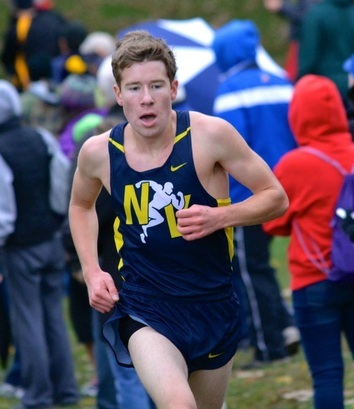 Connor entered the NV program as a highly touted age-group runner. He ran a 4:44 mile in 8th grade and had been in our summer program for many years. However, no one anticipated that he would run 15:08 as a freshman at Detweiller, ranking him as the 8th fastest freshman in the history of Illinois at the time. Connor's sophomore year did not happen due to a fracture in his navicular bone in his foot. The injury occurred during the track season, but he needed all fall to heal from the surgery. As Connor approached his junior year, we took a conservative approach, having him swim once a week during the summer. We also approached races more conservatively after he had trouble finishing his first race back at the Hornet-Red Devil Invitational. Connor saved his best race for the State meet, patiently waiting to make a move after hitting the two mile mark in 16th place. He moved up methodically and kicked in to finish 7th overall. His time was the third fastest for a junior in our history. Only future Footlocker All-Americans, Danny Pawola and Chris Derrick ran faster. The first time we saw Jackson Jett, he took off like a jack rabbit in a middle school race, and built a 300 m lead by the mile. When asked why he did this year's later, his response was, "Coach, it was middle school. I figured if I started out really fast, the other kids would just give up". He was partially right. The reason the kids never got close to him is because he was able to maintain a good pace. After entering high school, Jackson had trouble managing the many variables that came his way. He played basketball, and running was not a high priority. Jackson was plagued by injuries early in his career, because he always pushed the envelope on training. He is extremely tough and a great competitor, but he had to learn to balance those traits with his training. By the time he was a junior, he had it mostly figured out and started running in the low 15's in many races. In the DVC championship, he finished a close 2nd to teammate, Dominic Dina. Jackson was our 6th man that year in the State meet, running 15:09. After a groin injury cut his junior track season short, he got on a roll. Now training consistently, he kept improving. He was the individual Sectional champions and was our number one man at the State meet, running 14:32.3. This feat ranks him as the 5th fastest individual in our history at Detweiller! Chris Keeley: 21st as a senior in 2018 (14:47.8). Chris is one of those runners you love to watch. His stride is long and efficient. A good friend of Zach Kinne, Chris played baseball until Zach convinced him to run track in middle school. Being naturally talented and having a great work ethic, Chris found cross country to his liking. However, stress reaction shin injuries would plague his career until he finally found a consistent stretch his senior year. Chris always had some natural speed, and also found success in track where he helped our fs 3200m relay set a school record when he was a freshman. We knew he was ready to have a great senior year when he ran in the low 9:30's the night before the State track and field meet as a junior. Chris partnered up with teammate Michael Madiol to have a great senior year. They often ran together and finished within a total of 2.7 seconds from one another in the Regional, Sectional, and State meet combined! Chris was a champion of cross training and he will go down in history as a guy who overcame obstacles to be an all-state runner. Zach entered our program as a precocious freshman. As an age-group runner, he had already shown he had the potential to be a varsity runner right away. He did not disappoint, running top 7 for us all fall until he experienced hypothermia from the Sectional race. He ran 15:03 at Detweiller at an invitational earlier in the year. As sophomore, Zach continued to mature and was an integral part of our State championship team. As the only underclassmen in our top 7, he finished 17th in the State meet. The excitement only built for his junior year. Zach came off a great track season and won many invitationals (and Conference) leading up to the State meet. He ran a great race, making sure he did not fall apart in the last 200m, and finished strong in 4th place. That spring, he ran 9:03 to finish 2nd in the 3200 at State. Zach moved to Pittsburgh the summer before his senior year, running for North Allegheny High School. Zach was a fierce competitor and a great teammate. Even though he was not with us his senior year, his leadership qualities remained with our team during a great 2018 season. Michael Madiol: 19th as a senior in 2018 (14:45.86). Michael made a big leap between his sophomore and junior year. He ran 16:10 as a sophomore, just missing our top 12 roster. As a junior, he ran 15:10 at State and was our 4th man on the 2nd place team. He also ran 4:23 indoors for a 1600m before a nagging knee problem sidelined him for the rest of the spring. Michael always performed best at the end of the season, and this pattern continued his senior year. He was a top three placer at DVC, Regional, and Sectional. After the State meet, he went on to do very well in post-season meets and attracted the attention of schools like Purdue and Illinois as a result. Michael will study engineering and run at Illinois. We look forward to seeing his continued progression. Jake entered his freshman year at NV as an experienced runner. The big question was, would he continue to develop or be satisfied with prior age group performances? Contributing to our top seven as a freshman, it was obvious Jake was serious about getting better. As he matured and reflected on prior seasons, he continued to get better. Nutrition and sleep became a priority. He started training and racing smarter as the years went on. After a couple set backs from a freak hip injury (while jumping a creek), and a stress fracture of the tibia during his junior track season, he was able to train consistently. Jake ran in the State xc meet 3x, running 16:13 as a freshman, 15:03 as a junior, and 14:46 to place 21st as a senior. Jake is a true student of the sport and lives and breathes running. He has been a great student-athlete, and can always be counted on to dialogue about training and racing. Jake will go on to run for North Carolina. He will only improve, but maybe more importantly, he will make everyone around him better in the process. Also known as "Mongoose", Matt started running in 8th grade due to the encouragement of Scullen Middle School Coach, Scott Todnem. He finished in the top 10 in the middle school conference xc race so it was obvious he had some talent. Matt ran well his freshman and sophomore year, but did not really start contributing to our top seven until his junior year. What made this especially remarkable, was that he was very young for his grade. Just like Chris Derrick, he did not turn 16 until October of his junior year. Unbelievably, they share the same birthday. So, as a junior, he was our 2nd man at the State meet, running 15:00.6. As a very young 17 year old senior, he ran 14:46.7 to finish 23rd overall. As our 4th man, he ranks as the fastest 4th man in IHSA history! He was fortunate to travel to Portland as a member of the Naperville South team 2x. Matt is also a great student, accumulating a 4.4 GPA. Matt's legacy is one of consistency and someone we could always count on at the end of the season. Danny Pawola: 8th as a junior in 2007 (14:33.4); 5th as a senior in 2008 (14:31.3). During Danny’s freshman year, he first showed promise at the Sterling Invitational, sprinting out to lead the junior varsity race while holding on to a top ten finish. It was at this point, I knew he had a competitive spirit. However, he was not an outstanding talent by any means, running in the 16:40’s for 3 miles. His sophomore year was a very frustrating season for Danny even though he managed to make our varsity squad. He ran in the 15:30’s at Detweiller but slowly succumbed to sickness and tired legs. It was the winter of 2006 that became legendary in NV lore. Danny decided to model after Chris Derrick. He put in a great base, lost ten pounds, and ran 9:16 for the 3200m, becoming one of the fastest sophomores in the country. The summer before his junior year, he worked even harder and never missed a day of training. His efforts did not go unrewarded as he was a consistent top-five finisher at major invites. That year, Danny saved his best race for last, leading the chase pack at State and finishing 8th overall. Danny’s senior year began with a great summer of training. At the end of July, he was running workouts comparable to Chris Derrick from the summer before. He started off the year winning the Hornet Red Devil Invitational. However, the next two races he ran against super freshmen and finished second in those invites. He looked great at Conference, while becoming NV’s fourth different individual winner. Danny continued to run relatively well (but not his best races) through the State meet (finished 5th). After the Nike Regional meet, he decided to change his diet (added more protein and ate better) and he surprised everyone by qualifying for Footlocker Nationals by placing 9th in the Regional meet. 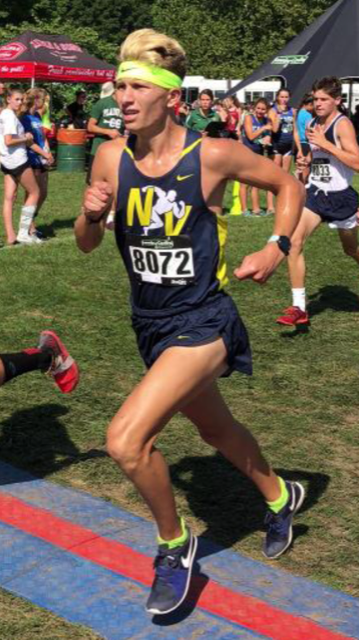 He then shocked everyone by finishing 13th at the National Footlocker meet while earning the honor as NV’s second straight All-American (top 15 are regarded as All-American). It was obvious from the very start that Jimmy Riddle was a very talented runner. He joined us for the Oregon camp the summer before his freshman year and made the decision to run cross-country instead of play soccer. Jimmy started off placing 2nd overall at the first invitational in the freshman race only to suffer a stress fracture in his leg a short time later. During his sophomore year, he was able to finish the season as our 9th man, running in the low 16’s for 3 miles. It was the track season of his sophomore year that gave him the confidence and will power to turn heads his junior year. The summer before his junior year, he ran almost 1,000 miles and his hard work paid off. He finished within one place of his teammate (Chris Derrick) at all meets except the State meet. His State meet performance ranked him tied for #3 all-time in school and District 204 history at that time. Jimmy’s senior year was marred by a stress fracture that did not allow him to finish at his best in the State meet. He was in the top 25 with less than 300m to go when he ran out of gas. His effort was a true inspiration to us all. His greatest legacy might have occurred when the official IHSA Season ended. Jimmy ran in the National Nike Team Cross Country Championships in Portland and finished 6th overall, helping the team win the national championship. Taylor Soltys: 15th as a junior in 2010 (14:39); 10th as a senior in 2011 (14:42). 74th. That was Taylor Solty’s place as a 7th grader in the conference meet while he was in middle school. An avid swimmer through middle school, Taylor decided to give xc a try his freshman year. It was immediately obvious that he was going to work hard, but he was only our 4th or 5th best freshman. His sophomore year, he started to show that consistent, hard work does pay off and he won the fs Conference title going away and ran 15:42 at Detweiller that year. Because he did not quite make our 12 man State roster, Taylor had a chip on his shoulder and worked even harder to make a difference his junior year. He did just that by winning the varsity Conference title and was the IHSA Regional champion surprising many by beating a very good Lockport runner. Taylor went on to run a perfect race at the IHSA State meet and finished 15th overall to achieve All-State status. Taylor’s senior year had many ups and downs. He had a rough track season his junior year due to an achilles injury and ankle/foot issues continued to plague him throughout the summer and fall. However, like all great runners, he persevered and ran his best race of the year at the State meet, finishing 10th overall. Taylor Soltys left a legacy of hard work and sacrifice that few before him have been able to match. No one wanted to win as a team as much as Taylor, and his determination and high expectations will live on through all of us. Michael ran 19:24 as a freshman. He was not on anyone's radar screen as a possible varsity runner, let alone an all-state performer. Michael's secret was much like other NV champions before him - moderation and consistency. Michael worked and worked. He did everything we asked and simply kept improving every season. As a sophomore, he ran in the mid 16's for 3 miles, and ran in the State meet as a junior, running 15:34 as our fourth man. Very few even mentioned his name, until he dove across the line, in the Joliet West IHSA Sectional Track and Field Meet, to qualify in the 3200m. It was only at that time, did others realize he was a force to be reckoned with. Michael had very few injury setbacks and put in another 1,000 mile summer before his senior year. His work and mental toughness paid off in the State meet, where he ran a smart race to finish 18th overall. His training partner, Daniel Weiss, was right behind him in 28th place. Connor Horn (14:36), Michael (14:48), and Daniel (14:54) made up the fastest trio in the State in 2015. His legacy will be his rise to stardom through a disciplined work ethic and a self belief that he could be an All-State runner. David Wing (right): 20th as a senior in 2009 (14:52). The one thing we always knew about David is that he had a lot of heart and he worked hard. Throughout his years at NV, he was unable to completely show the fruits of his labor due to many injuries. We knew he had potential for greatness, but we were not sure it would ever come to be. As a sophomore, he ran just over 16:00 at Conference and illustrated that he would probably be a varsity contributor down the road. As a junior, he was on the very edge of making our top 7, and because he did not quite make it, it served as extra motivation the next year to make a difference. The summer before his senior year we saw a very determined young man willing to do all the necessary strengthening exercises and the long runs around his lake house on Saturdays. This seemed to be ‘the cure’ and he was injury-free his entire senior year. After our pack split up a bit at Hornet-Red Devil, David took the lead in keeping our pack together in future races behind Aaron Beattie. It was David who was our pace-setter. The team meant more to David than any individual accomplishment. He ran with the pack until the last mile and then he was able to finish better than most. In fact, at the 2009 State meet, David was the only runner in the entire field that ran his second 1.5 miles faster than the first. David ran 14:56 in very warm conditions and would have probably run in the 14:40′s on a better day.